The first Tuesday of every month, I'm selecting a feminist, business, or self-help book to review for that month. And, rest assured — if I'm featuring it — there’s something you oughta know! Last month, I covered Profit First: Transform Your Business from a Cash-Eating Monster to a Money-Making Machine, by Mike Michalowicz. He's a cheese ball, but a cheese ball that is one of the top people I reference in my business. 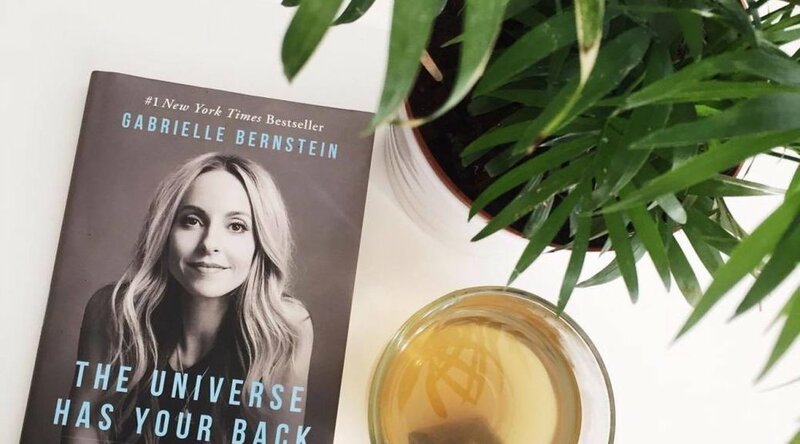 This month, I'm reviewing The Universe Has Your Back: Transform Fear to Faith by Gabrielle Bernstein. Takeaway #1 - The power of the "holy instant"
I loved this lesson that Gabrielle reinforces in her book — that a "holy instant" can be a moment you claim in your day to reset and empower yourself. We can fill our minds up with a lot of garbage and instead of going through a long period where we just feel terrible about it, we can take a moment to clear our minds, have some peace, and start over. In December, I wrote about The 33 Books I Read in 2017 with A Course in Miracles being my least favorite saying, "it felt like a bunch of gibberish" but "there's a huge following around it, though, so I'm obviously in the minority." Gabrielle references this book in 70% of her pages. I'm not joking. It's shocking, and was a huge turn off for me. She really brings it with sharing experiences where she has struggled and overcome. Instead of just being preachy, she comes off as human and relatable. At one point she shares an experience she and her husband had of house-hunting in the daunting New York City market. She said that in the flurry of frustration she asked that they say a prayer and ask the universe for direction (something like that). The idea then came to her that they had been wanting a country house in the future, so instead of trying to compete in the city, why not start now with the dream countryside home? SPOILER ALERT Gabrielle went on to talk about her success with finding her "Mountain Home." Gabrielle encourages you to pick an animal and visually look out for it to help validate your decisions. I don't know about you but I'm not much for animal signs, or signs in general to tell you what you should or shouldn't be doing. I'm all for serendipity and the universe coming together for your good. But animal sign validation? Nah. I mean, I can't fight that. I'm all about the love, too, and truly feel like it can solve all of the world's problems. With quotes like "the universe doesn't respond to manipulation, the universe responds to love," I'm all in. I wouldn't. Some nice points but overall too much name-dropping, New Age glamour and not enough substance. There are 10 spiritual self-help books I would recommend before this one. Now, for your thoughts! If you’ve read The Universe Has Your Back, what would you rate it? Do you agree or disagree with anything the book has to say? Next month I'm featuring White Hot Truth: Clarity for Keeping It Real on Your Spiritual Path from One Seeker to Another by Danielle LaPorte! Read it with me!